In the care of the National Trust is Culver Hole , in the Cliffs near Port Eynon Point. 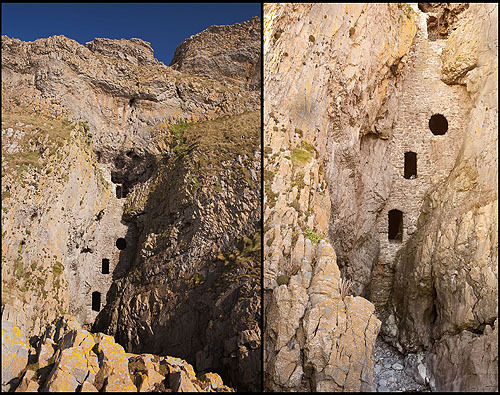 An amazing 20m high wall of masonry , with look out windows , has walled in a cave on a remote part of the Gower Coast. The Cave was sealed off when a medieval dovecote was built. In Old English - calver means "coutre" - Pigeon or Dove. There are stories about smugglers using it and being a castle , but the nesting boxes appear integral to its structure.